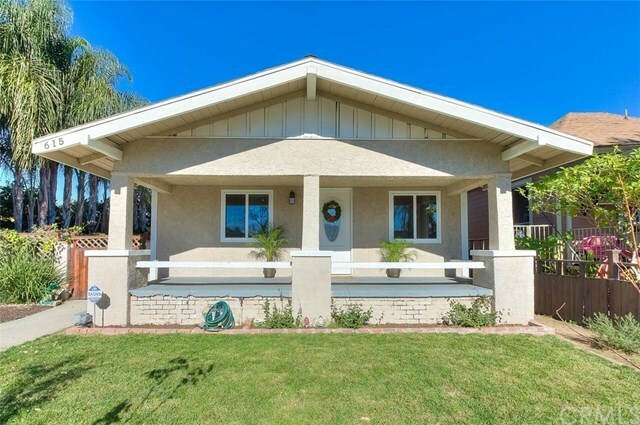 Remodeled, Beautiful, Vintage Ontario Craftsman 3 Bedroom, 1 Bath on Large Lot w/RV Parking! Welcome Home!!! This Home offers A Modern Flair and The Feeling of Yesteryear all wrapped Up Together with a Big Bow! Charming, Covered Front Porch Plus Additional Unique, Side Yard/Entertaining Area w/Pavers are Perfect for Summer Evening Dining al Fresco, Entertaining and Outdoor Fun!! Inside, You'll love the Brand New Neutral Vinyl Flooring, Dual-Pane Energy-Efficient Windows, Crown Molding in Living and Dining Rooms, Soft Water System and Brand New Water Heater! Spacious Living Room offers filtered light all day making the Space Inviting and Relaxing! Remodeled Kitchen with Granite Counters, Upscale Molding at Ceiling, Glass Door Cabinet and recessed lighting make cooking Your meals a pleasure! Spacious Remodeled Bath w/Separate Tub, Shower, and New Shower Door. Inside Full-Size Laundry Area with Built-In Storage in Hallway. The Bedrooms are nicely spaced apart with 1st bedroom offering separate Private Entry! Yard is tastefully manicured and cross-fenced offering abundant possibilities, Plus Allowing You to keep your Pets separate from Your Guests! Detached One-Car Garage w/alley access is Perfect for Your DIY Projects/Hobbies or Parking! Convenient, Flexible Rear fence allows additional Rear Yard parking! Bring Your RV and Save on Monthly Storage! :) Fenced Front Yard Offers Privacy! Outdoors and Pet Lovers Welcomed! Conveniently located near Downtown! Call for Viewing! Directions: E/Euclid Ave. and North of Holt Blvd.